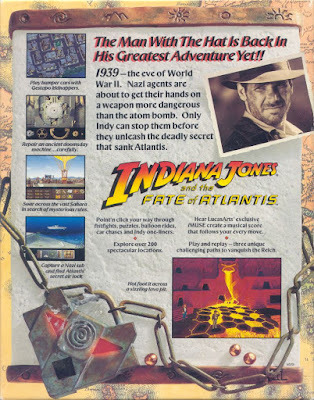 Indiana Jones Journal Entry #2: I'm now on the look out for the mythical Lost Dialogue of Plato, which supposedly leads to the mythical city of Atlantis. I'm sceptical that Atlantis or the Lost Dialogue even exists, despite having personally witnessed the magical powers of the mythical Ark of the Covenant, the mythical Sankara Stones and the mythical Holy Grail - hell, I've personally spoken to an 872 year old man!!! 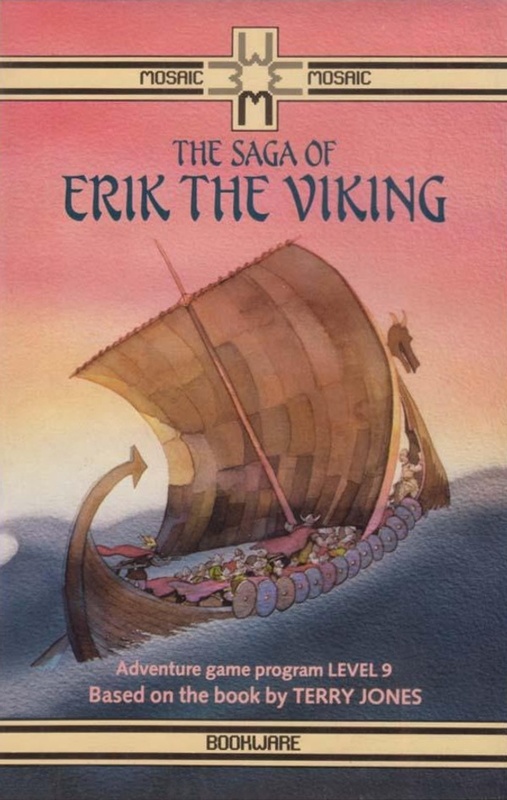 Anyway, I'm for some reason still sceptical of mythical historical objects and locations, and am only looking for one as an excuse to beat up some nazis. So far, my investigations at Iceland and New York have given me two clues - one that leads me to the Azores in Portugal and another that will take me to Tikal in Guatemala. And don't even ask how a journal written in 1939 contains Wikipedia weblinks??? Last time, Icelandic eel chiseler, Heimdall, told me to visit Costa in the Azores. The one location that the game takes me to in the Azores is Costa's front door. I try to talk to him with Indy, but don't get very far. So I talk to Sophia and ask her to take over. Now in charge of Sophia, I try again. I get further, with Costa actually leaving the house instead of talking to me from the crack in the door. Video games, like any other form of entertainment, are meant to provide recreation. So taken together, through our leisure activity, we are being reborn. 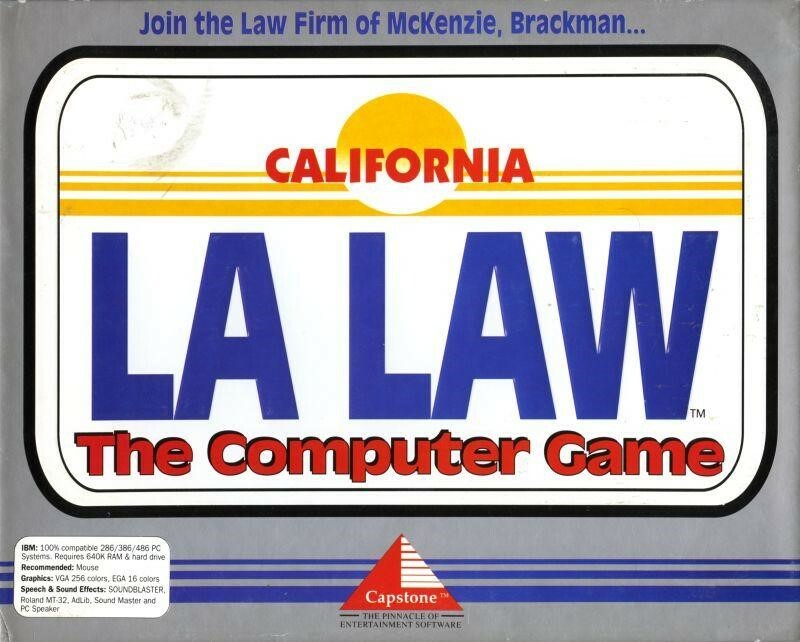 This is why I have to chuckle when I, a lawyer by day, am playing a game like L.A. Law: The Computer Game. 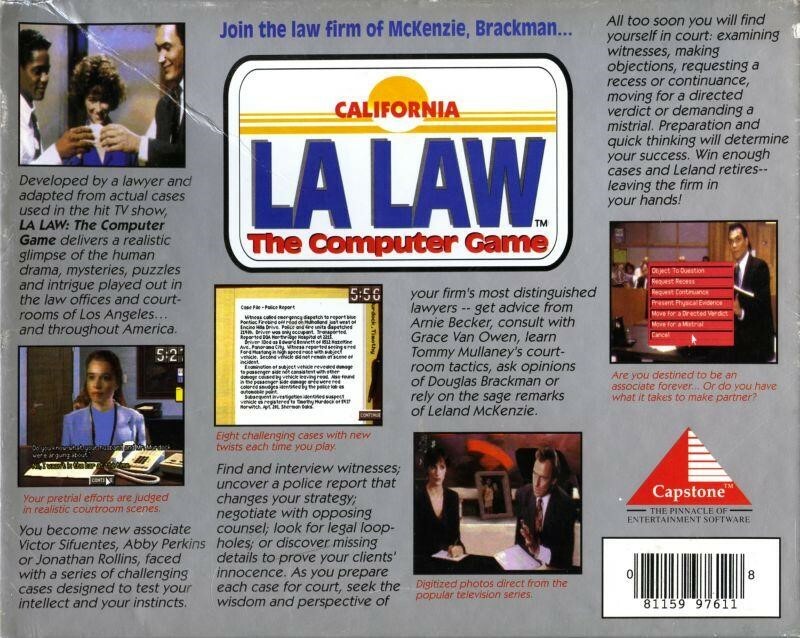 As The Adventure Gamer’s resident legal eagle, I have already been tasked with playing two Police Quest games. And while those put the player in the shows of the street-level law enforcement officer, they touched a little bit on the law—I’m thinking of the first Police Quest’s reliance on proper police procedure in order to successfully make the bust, and make it stick, and Police Quest III’s oh-so thrilling paperwork puzzle. Police Quest I had you testify in court to keep a no-good perp in jail, and Police Quest III also had parts where you had to testify in traffic case and discuss evidence with a judge in order to get a warrant, so I’ve been in a virtual courtroom as a part of my duties on this blog before. 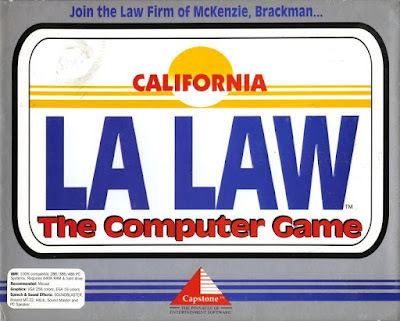 But L.A. Law will be the first time the game is focused exclusively on being a lawyer. And here we are, finally at the end of the Lost Files of Sherlock Holmes. We solved a murder (or three), reunited a woman with her son, and explored the highs and lows of 19th century London. This has been a fun game, but it will also be a challenging one to rate. I know many of you have fond memories of this game, but nostalgia makes everything nicer. I had never played this game before. All we can do is start the rating and see where it ends up. As I explained in my last post, we will be doing a small experiment this time around by including some reader ratings for the game. I’ll include them as a counterpoint after I complete my own review. Before we can get there, we have one piece of unfinished business: our “unexpected” contest! While my vote went to The Curse of Monkey Island on this one, I agree completely with Torch, Rowan Lipkovits, Alfred n the Fettuc and Draconius – this game had one of the best introductions ever! So I thought I'd share it with those of you who don't own the game or want to revisit the opening. Enjoy! For those who don't have the time or inclination to watch the video, the game starts with Indy looking for a statue for his friend Marcus Brody. He keeps getting knocked down through levels of the museum until he finally finds the statue he's after in the cellar. He takes it back to Brody, who's talking to a German man called “Smith” who wants the statue. Smith turns out to be a Nazi (Indy hates those guys), there's a fistfight and Smith escapes with the statue, but Indy has grabbed his coat containing a Nazi identification and an archaeological journal containing a story about a digsite once managed by Indy and his young apprentice Sophia Hapgood. Indy decides to find Sophia in case the Nazis try to get to her instead. 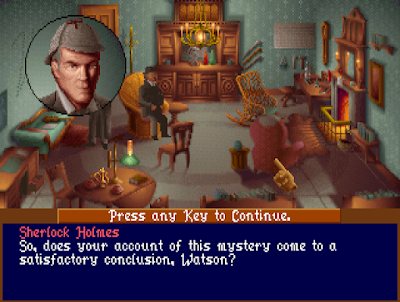 The Lost Files of Sherlock Holmes - Won! Welcome back! Well, you’ve read the title already so you know that we are reaching the end of our Sherlock Holmes adventure. It’s been a fun ride. As I left off last week, I had just “solved” two more murders, the detectives hired by Anne Carroway, and captured their killer. Is that the end? Not quite. Although we have the triggerman, we do not have his boss: Lord Brumwell. My guess is that he is the ringleader behind all of these crimes, all in an attempt to keep the truth about Paul’s parentage (and his affair with Anne) out of the spotlight. 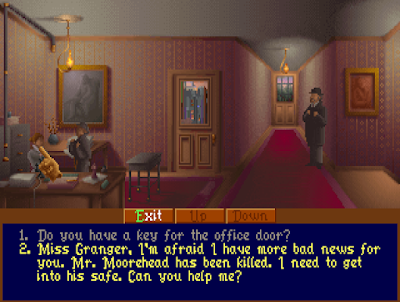 My best lead right now is that the detectives supposedly had Anne’s missing pendant, but apparently not with them when Mr. Hunt killed them both. I’m going to start today by returning to their detective’s office to search for more clues where they might have hidden it, but we also still do not know where Anne is hiding and might have to track her down. But before we get there, I have two quick notes. 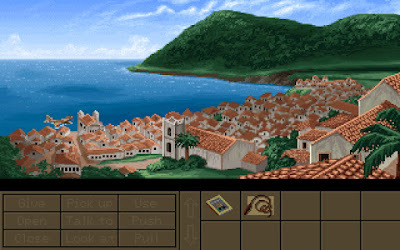 First, as you might have read on the Final Rating for Quest for Glory, I’d like to do an experiment: If you have been playing along or have played the game recently, I invite you to write up your own quick thoughts, just a couple of sentences, and send them to the blog. I’ll try to edit your thoughts into my Final Rating post as either an agreement or a counterpoint. We’ll see exactly how it looks when we get there and we’ll award some CAPs for anyone that participates. I also have a small CAPs contest for this game which I will talk about at the end of this post. Enough of that, let’s solve this case. What’s Terry Jones got to do with adventure games? And what's bookware? A weapon more dangerous than the Atom Bomb??? We're gonna need a hell of a lot of refrigerators! 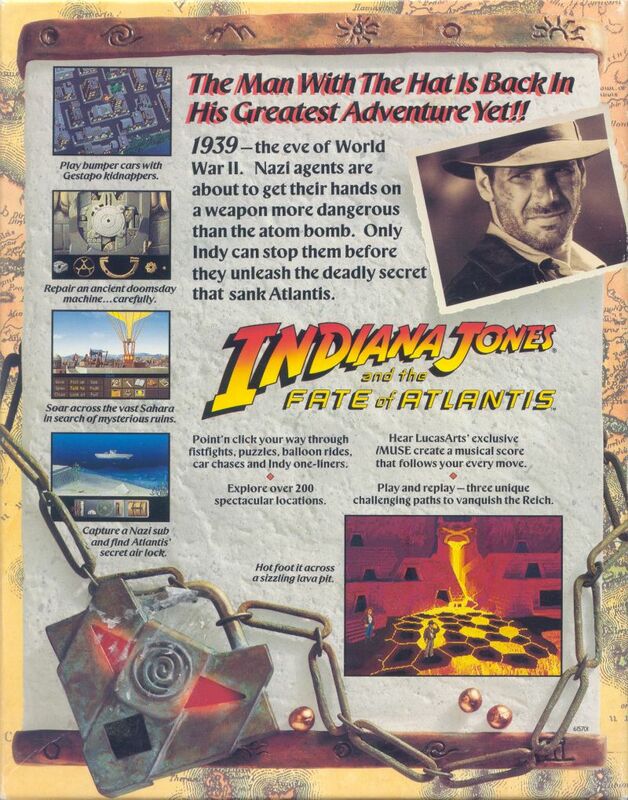 So what is Indiana Jones and the Fate of Atlantis? 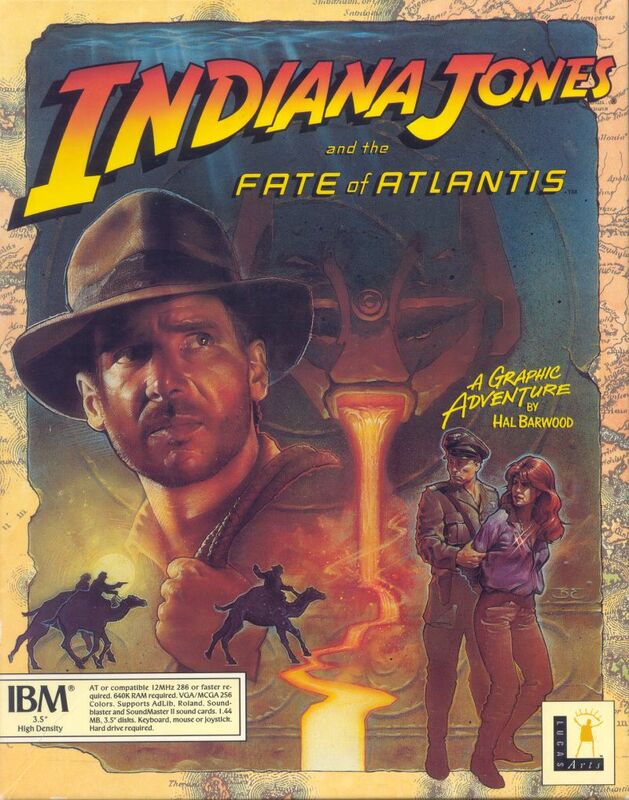 QUESTION: Who is Indiana Jones? 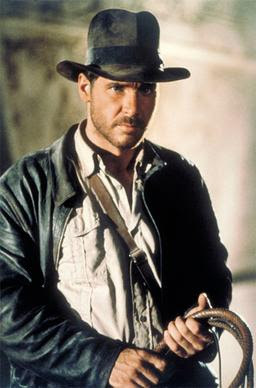 But honestly, if you don't know about Indiana Jones, do yourself a favour and watch Raiders of the Lost Ark. There's a reason it's the answer to the “My favourite movie is...” question in my What's Your Story? QUESTION: What is the Fate of Atlantis? ANSWER: It's in the Pegasus Galaxy and currently inhabited by humans from the Stargate program. Now that the basics are taken care of, let's get into the game. 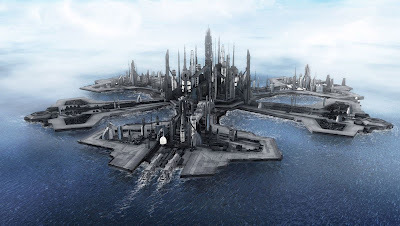 We left off last time having reached the bridge of the spaceship we’ve been blundering around all this time, having rediscovered that we are its cyborg captain and need to fix up and land the thing in order to safely deliver a precious cargo of humans in suspended animation. We had several pathways open to us and apparent problems to solve to do so - let’s dive in! 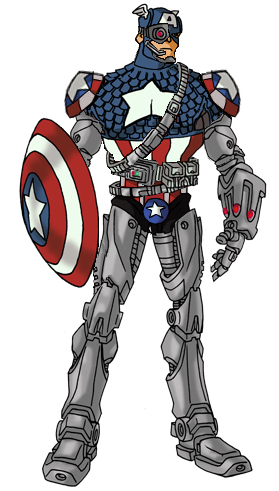 Potential surprise twist: as “Captain Cyborg,” we looked like this all along. Welcome back! Last time out, we arrived at what I think will be the meat of the case: adultery. An aristocrat named Lord Brumwell had an affair, and a child, with a servant (and eventual opera singer), Anne Carroway. He accepted the child as his own but hid her parentage even as he kept his former lover on as a nanny. Years later, she was let go and was only permitted to see her son on brief visits outside his private school. Lord Brumwell caught wind that she was going to try to claim paternity-- she had a letter which proved that Paul was her son-- and so he hired a small-time crook to try to steal it from her. The robbery was double-botched both because he killed his victim and because he targeted the wrong sister, but completely by accident he got away with the letter anyway, only to pawn it off thinking that it was just a pendant. He tried to make the whole mess look like a Jack the Ripper crime, but we managed to pin it on him. Anne is now in hiding somewhere and we have to try to find her and prove that Lord Brumwell is the “real” murderer. It feels like we are nearing the end. I ended last time having just visited Lady Brumwell, but while she knows about Paul, she doesn’t want to admit to anything. I had a lead of some foul-smelling and specialized tobacco that we found in her house, but the tobacco shop surprisingly didn’t have anything to say about it. Without leads, I checked and re-checked every location until I found something new: this time when I visit the murderer, Mr. Blackthown, in jail, Holmes taunts him that he had the letter all along and didn’t know it. 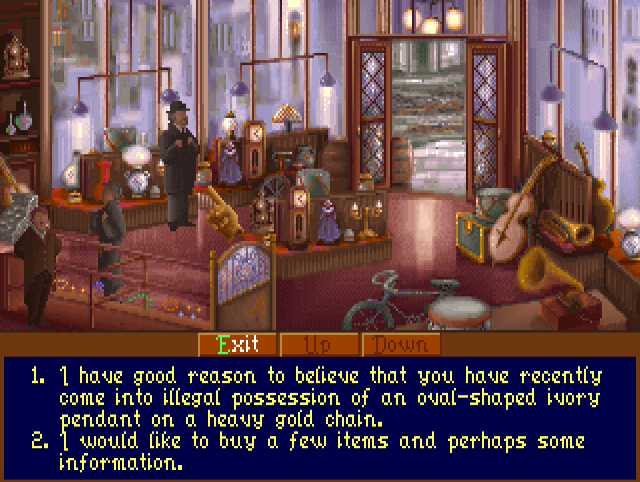 Somehow this convinces him to tell Holmes where be pawned it. We run off to the pawn shop and the owner is reluctant to talk, but Holmes manages to convince him as well. 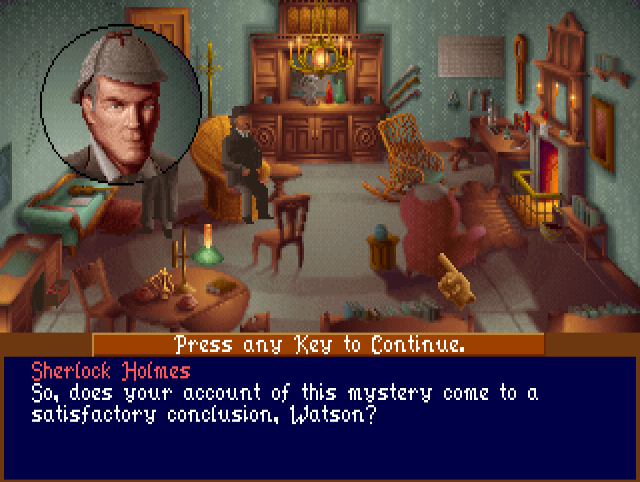 He’s a very convincing detective! And I just have to keep hitting the “Talk” button! The shop owner provides us the address of the man, Mr. Moorehead, that he sold it to, but also a warning: another man, Robert Hunt, is searching for the same pendant. That name isn’t familiar, but the pawn shop owners tells us that he is “rough trade” and implies he is someone not to trifle with. Is he on Anna’s trail as well? A second criminal hired by Lord Brumwell or someone involved for some other reason? Time to rate the game! I had a bit more to think about when rating this game as opposed to others. In particular, I compared it with the original Hero's Quest, other Sierra VGA remakes and my own previous ratings to ensure the rating is somewhat consistent. Which version will score better? I also asked for my fellow reviewers’ help when my first ratings came out a lot lower than I’d expected. They’d pointed out a few things I hadn’t considered and as a consequence the final score ended up a little higher… still nowhere near as high as everyone anticipated (Sorry, Corey.) I largely put this down to my total lack of nostalgia when it comes to this game and series. The last few months have been my first interaction with Quest for Glory and it shows in the way I haven’t been as blown away by this game as most people who played the series in the 80s and 90s were. Happy new year! I hope you all had an enjoyable year and enjoyed our Christmas and New Years bonus posts. The good news is that I was able to make significant progress in Sherlock Holmes while relaxing near (but not on) a beach, so that’s something. Just a reminder that last time out, I had finally tracked down Sarah Carroway’s rugby-playing boyfriend, but he wasn't cooperative. At first he refused to admit that he was seeing her at all-- instead suggesting that his bookworm roommate was her real beau-- but once we talked to him enough he agreed that he was really her boyfriend, but he didn’t want his coach to find out. He then refused to admit that she was dead unless we brought him her death certificate. We found said certificate at the morgue, but the rule-following guys at Scotland Yard didn’t want to lend it to me. I was stuck. I remained stuck for a while, but while I was waiting for Florida to realize that it’s not supposed to be 40 degrees Fahrenheit, I discovered that I was going about it all wrong. I asked the newspaperman back at Baker Street, the one that sells back issues as well as current papers, if he has the edition that announced Sarah’s death. He doesn’t, but he sends me off to Fleet Street to see if they have that edition. 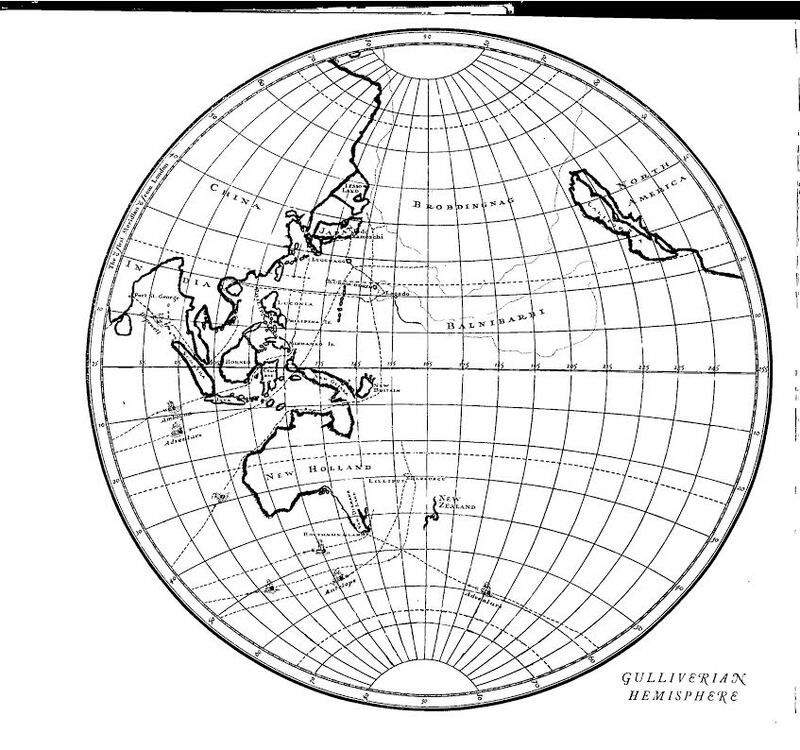 (Watson had this paper at the beginning of the game; I suppose he must have tossed it since then.) 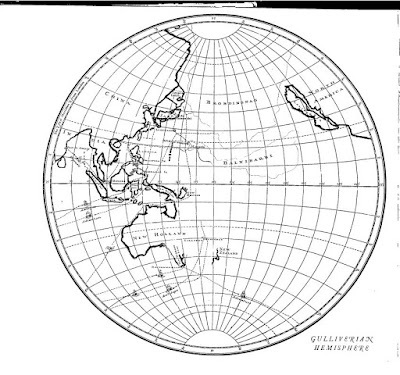 I head there, except that there’s no new location on my map! I head back to Baker Street and this time talk to Wiggins who agrees to go to Fleet Street for me. In the process, we discover that he actually has that paper already as he’s been using it as insulation in his coat. We take the paper and Holmes hands Wiggins some cash for a new coat. Is there a way to nick the death certificate from the morgue? It seems more than suspicious that the coroner just left it out for us to see but not take. Is this one of the “alternate solutions” that I’ve heard so much about from the comments? Quest for Glory I - WON! 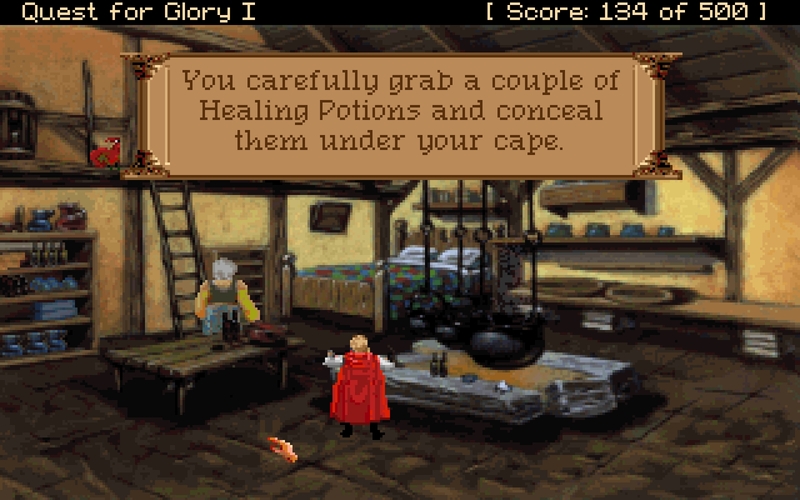 When we last met our Quest for Glory characters before our Christmas detour, I'd asked for assistance. I had help from Ilmari who told me that, as I had feared, I was dead-ended! 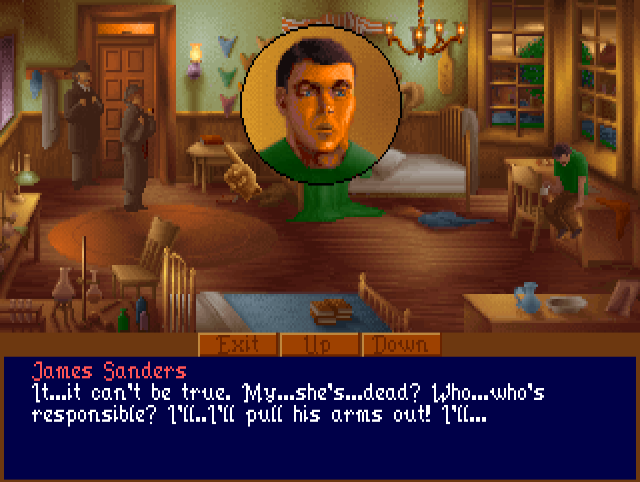 Of the games I've played for the blog so far, I've hit a dead end in King's Quest V (which I got out of on my own after wasting an hour or so) and I've hit a dead end in Martian Memorandum (where I didn't pick up a newspaper buried in a jungle before going to Mars.) The only game I haven't been dead-ended in was the game with very few puzzles at all – Leather Goddesses of Phobos 2. Corey Cole mentioned in the comments of my introduction post that there should be very few if any walking-dead situations. I should have known then that if there was a single dead-end situation, I'd find it and I'd be annoyed by it! It's kind of my thing - I'm the one who's bad at adventure games! Anyway, with the bad news sinking in, I went back to the saved game that took place before I was dead-ended after finding out to my dismay that that saved game was in fact no longer on my save game list! The game allows only 20 saved games and all 20 of them were from after that point. This is the moment the game becomes unfinishable. Seems innocuous enough. Fortunately, my obsessive personality has me backing up my QFG folder every time I finish up my 20 allotted saves. So I reloaded a save from 4.5 hours earlier, and proceeded to continue the game. Phew!